No reason, it's a decision from IDP. It's likely cheaper to manufacture & release everything that way. Also I'm guessing people might be tempted to order all of them at once rather than one every month or so (and few/many buyers giving up on the series). No known reason. BD-sized releases that aren't ThatAwesomeShowFromAYearAgo series do not sell well for sure. As for the format, why not? If you don't know the answer, don't say bs. It's a decision from IDP. The last you heard is rather that they wouldn't license it to anyone. But it has changed only very recently and Dynit being fast on the trigger, they have already announced it and listed it. Manga UK got to release it earlier because they signed with Sony a different deal, where they were taking over all their titles (including the titles that had were completly exploited like Paprika, not the kind of deal you'd want when you pay for a title you can't get any revenue from). And again, no. IDP told me its one of the few acceptable seller of the Saphir line. It's just that Aniplex refuses to sell the title elsewhere. While I don't know any of the details, there's a possibility the Bebop release was silently delayed for a reason you mention. But then again, it's problematic to add a featurelength movie to a finished boxset that was approved by the Japanese licensors. One have to start the whole process again (and if the movie is owned by a different rightholder, it's twice the trouble). There's a high chance it was delayed too for other reasons. An approved prototype of the box and few of the inserts were displayed at Japan Expo (July 2018). f you don't know the answer, don't say bs. It's a decision from IDP. And about Dybex, it's likely that the release will come out but we will not know until the day ... With Dybex nothing is certain with the dates. That's quite interesting. Here (for manga at least even when they're finished in Japan) they try to avoid putting out too much. Which others are included in that "few"? I think the A4 set are great. Somebody has to tell me what's the point of a tiny ridiculous A5 sized artbook in which you can't see **** (and the images are scalled to allow nice margin and all, so you cannot see anything in the end and you just notice the artifacts of the printer rather). Now that I actually have the S;G (Dybex) A4 box, I kind of wound up liking it somewhat really fast. At least the Dybex A4 one, which really fits in fine next to the artbook and the box is also not so fragile looking, that it would break from all of the weight tension. With the box having a sidewards spine the artbook's own missing spine is not much of an issue either. In terms of the artbook which has so much artwork, the bigger size really is nice. And right the second moment I though how cool it is, it just had to add my favorite two illustrations on a half page. instead of 90° flipped like they did with just about any other portrait ilustration. So, now that I got a taste in those A4s. (And probably should test out how long my disliking the IDP A4 apspect ration would actually survive when faced with the real thing) - How are the releases of Card Captor Sakura and Spice & Wolf like? Are their artbooks just as extensively illustrations-rich as the S;G artbooks? I have the old CCS DVD box, whose illustration choice on the cover I quite like. (Definitely more than the BD), so I was fine with it. But then the BD is, well, a BD. How's the remaster like in terms of quality? Same questions more or less for S&W. I already got the Funi US release. I quite like the illustrations of Ayakura Juu, but the LN illustrations artbook itself has been OOP for a while in Japan. If the A4 one's really artwork rich, I could just go for that one instead. Exactly the reverse for me. I hate when a simple release is ultra fat (say those amaray boxes used on movies by AL here, it's just a lot of wasted space for a simple one-disc/two-disc release. Hence those sleeve with a digipak are an okay alternative. I have no clue for Sakura. ViC made a long video about it. You can see the whole book as well an extensive review on the authoring (which he says is good, it is based on the 2017 4K master). I reviewed Spice & Wolf for Anime-HD a few years ago. You can see the review here but it doesn't show much of the artbook. It's certainly not art-heavy compared to Steins;Gate. For example they used captures from the episodes for the characters summaries. If we talk about the video, the FUNi release has a very questionnable authoring on the first season while this one is fine. I'm unsure, some of the artwork of the second book appears to be from the artbook that came with the movie release. I remember discussing regarding the source of the art with a S;G fan and he said he hadn't seen a few illustrations before so I'd assume it include arts from various sources. Dybex stated it cost them a fortune to access all those illustrations. What amaray boxes on movies? Not sure about AL France, but AL UK is either a CE digipack in box or a simply standard BD Amaray case. I agree though, all the movies CEs can go rather space eating, as they have the same size as Anime series 1-cour sets. Hm, looks like most of the book is episode information. Is the S&W artbook about the same in terms of artwork vs. episode/character bio information? Oh I didn't know about that. They took some of the illustrations of the Anime-LNs and put them in there, which quite surprised me, because mostly those those satelite book releases' anime key illustrations are more often completely neglected in artbooks than not. (Jigoku Shoujo...) There certainly were also a lot of illustrations of S;G I hadn't even seen floating around the net, so that's a really nice extra. Did they (or anybody else) go as much out of their way like that with any other release? .... Actually Hyouka isn't even there in France. Any publisher who had expressed some interest in getting the title yet? I also own that artbook (I buyed that CE second hand just for that, and tossed the A4 box in the bin since I hate those). The book is 95 pages long, a little more than half of it (~52 pg) are pure artworks, sketchs, linearts, wich is really cool, unfortunatly the rest is only reviews of episodes, or not very interresting little notes. No StoryBoard, key aniamtion frames, or any interview from the staff. Also the format is not A4, it's a little tinier than that, because it's IDP format. PS : the majority of the artworks are illustrations from the LN illustrator. Fun-fact : the first 2 pages from the book use the same illutration, one is complete while the other is just the same but zoomed, it make no sense. If you can get it used or for less than 20€ it's "okay" but do not pay the full price (~40€) if you are only interrested in the artbook, its not worth it. It's about the same. There's little to no setteis in S&W. From what you're telling, I wouldn't really recommend it to someone who's seeking artworks. But at the same time there isn't that much usable art made specifically for the S&W anime. The rest of the art is "stuck" to the artbooks that Kadokawa released and they won't licence images from it. EDIT As my colleague stated above, if you want just the book, it's not worth it. Otherwise if you just need a nice S&W release, get it. I thought we were discussing about the format & size of those Conan releases. Oops. But yeah my point was that in France publishers use 10mm amarays while AL use thicker ones (I believe they are 15mm?) for similar releases containing one or two discs. The difference is really disturbing. Nadia. The box dimensions (thickness, the size is the same) isn't as optimized as S;G as in content gets more space to move around but the 100 pages artbook and the guide are excellent. In the meantime the Korean release of Nadia was released and is seemingly likely superior but that was released some 4 years after it? I need to compare it at some point. Jormungand is kind of similiar to Steins;Gate, there are two artbooks. One covers all the weapons used throughout the anime with details and the other has anime visuals . But again, there weren't much content to work with as they didn't produce a ****-load of visuals (Jormungand popularity is nothing compared to Steins;Gate) and so the artbook has 35 pages and the weapons guide has about 60p. The best one they have releases is still Escaflowne in 2011. It was for the DVD release and puts to shame any other Blu-Ray Escaflowne release in terms of contents. But it sold poorly and so they didn't make a collector edition for the Blu-Ray. And they also figured nobody would buy twice the same thing as one can buy the blu-ray in a basic edition and puts them in the A4 box if they feel like it. That Escaflowne set was sold in Germany, Spain, France and Italy by the way. I am also very slightly curious about the French dub, but not that terribly much. I guess, I'll keep that one in the backburner wishlist. Perhaps I'll wind up with another Rakuten order somewhen about something and that seller just happens to have that box in the store, too. But at the same time there isn't that much usable art made specifically for the S&W anime. I just come to realize the true merit of those A4s, you can actually get the artwork at all. I have no idea why UK and AUS like their 15mm Amarays. I would guess AL France uses 15m simply to reuse designs from AL UK. It's not as so much disturbing to me so far, because I regularly frankenstein the DVDs out of the Funi US combos or put 2 sentai half sets in one 4-disc case, those go to be 14/15mm for me anyway. I'm actually currently getting more disturbed over Funi's BD+Digital-only series, which are 11mm in a slipcover, lol. Those were totally only movies to me so far, now they're not anymore. The best one they have releases is still Escaflowne in 2011. It was for the DVD release and puts to shame any other Blu-Ray Escaflowne release in terms of contents. But it sold poorly and so they didn't make a collector edition for the Blu-Ray (and they also figured nobody would buy twice the same thing except with newer discs, one can buy the blu-ray and puts them in the A4 box if they feel like it). That Escaflowne set was sold in Germany, Spain, France and Italy by the way. Those A4 artbook boxes go all the way back to 2011? And then it sold poorly? It's interesting that they went for the A4s again, when it didn't do so well back then. But that clearly means, that IDP A4 is completly out of the picture for artbook frankensteining. Probably also out for Manga-frankensteining, as most Manga sizes here have higher height than BD. I'm starting to really not like that size all over again, lol. But that did make me wonder, how come the IDP S;G box is actually the slimmer IDP A4? Because the artbook is bigger than BD height (17mm.) Or did they they resize the artbook for that release's print? Popped up in my mail box and got me surprise. So BD height releases aren't dead after all. At least this kind of looks like it's going to look like No Game No Life, but it's from Black Box and not Kana. Seems like Black Box isn't coherent with their formats given Conan is DVD height. Conan are single releases for movies. This is a series. It's obviously not going to be the same format, even if its combo. This is an IDP A5 release by the way. Hellsing Ultimate Collector's Edition - OAV I to X - Combo - A4 sized with A4 artbook (56 pages) and an undisclosed goodie. 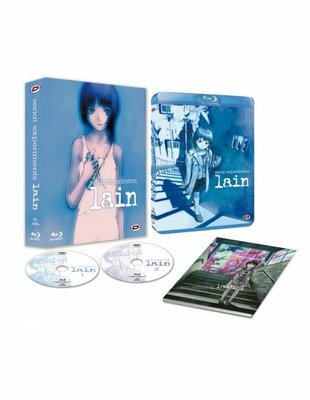 Serial Experiments Lain - Blu-Ray - With one booklet about the 35mm new scan (24 pages) and a sketch book (b&w), 100 pages. Prison School - Combo - Comes with an artbook (number of pages not disclosed) and two digipaks. Super jealous over that Hellsing release. I'd love for that to get a nice LE over here. I guess french anime-fans wont't be that excited: It seems that Dybex dropped the french dub after OVA 4. People in France care much less about dubs than in other countries. Just check amazon listing of boxset that are subs only in Germany, everyone is complaining. 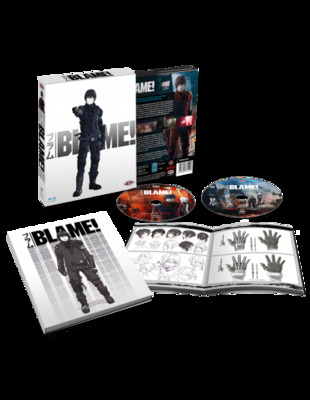 I'm probably going to pick up BLAME! because Dutch subs are included. I hope Lain includes Dutch subs, but Dybex didn't port over them over to the BD release of Escaflowne. That's not true: There are also various complaints in France, when a series with at least a small fanbase gets released sub-only. But the difference is: almost every anime DVD/BD in Germany has a dub, no matter how low sales to expect - whilest in France sub-only DVD/BD are more common (and several titles don't get released at all). You've may seen the "avec VF"-sticker on some releases? Q: What happened to Kazé France? This year only 2 releases so far (Silent Voice + last DVD of Sailor Stars). Don't expect a big big artbook, I have the Japanese set and the booklet included was less than 25 pages (and mostly contained Interviews with the staff) + the exclusive mini manga from Nihei (~10 pages) wich I doubt the french edition have acces to. What's strange is that I see artworks in that artbook preview that where not in the Jp Booklet, I wonder where they got them. There are complains sure, but the lack of french dub is not a death sentence for a physical release here. The French Market is already in a pretty bad state, so peoples buy news release even if these are sub only. > Kazé : they didn't get big big seller series recently (exept HeroAca of course) Wakanim and Crunchyroll are getting all of them, so they don't release as much but they're still ok.
"Pretty" Confirmed next is Captain Tsubasa 2018 + the usual suspect, like HeroAca, OPM, Jojo, etc. It's really too bad I'm not interested in any of those 4 titles.